Within three short hours of U.S. Rep. Keith Ellison's announcement that he would leave Congress to run for Minnesota Attorney General, Minneapolis state Rep. Ilhan Omar became a candidate to replace him in Washington. Omar became the first Somali Muslim legislator in 2016, defeating 22-term state Rep. Phyllis Kahn. Ellison's tenure has been marked by concerns he is hostile to Israel, something compounded by the Investigative Project on Terrorism obtaining a 2010 recording in which Ellison complains that Israel enjoys disproportionate influence over U.S. foreign policy. 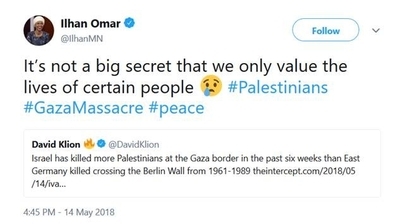 In the wake of last month's violence at the Israel-Gaza border, Omar blasted what she called "Israeli crimes" and called Israel's response a massacre. Palestinians and their advocates tried to cast the violence as unprovoked, and coming amid peaceful protests. In fact, a senior Hamas official admits the Palestinian border protests were "not peaceful resistance" and another Hamas leader bragged that the overwhelming majority of casualties were part of the terrorist group. 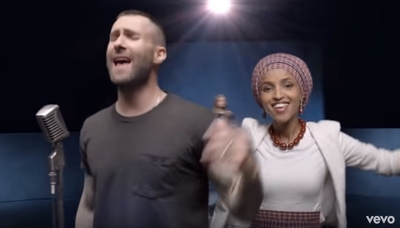 Omar also appears in a new video by the pop music act Maroon 5. That prompted a Twitter exchange in which a writer called her a "Jew hater." "Drawing attention to the apartheid Israeli regime is far from hating Jews," Omar shot back. The video always features Israeli actress and "Wonder Woman" star Gal Gadot, an Israeli citizen and veteran of the Israel Defense Forces (IDF). During the last round of Gaza violence in 2014, Gadot shared a picture of her with her daughter lighting Shabbat candles. "I am sending my love and prayers to my fellow Israeli citizens," she wrote. "Especially to all the boys and girls who are risking their lives protecting my country against the horrific acts conducted by Hamas, who are hiding like cowards behind women and children...We shall overcome!!! Shabbat Shalom!" 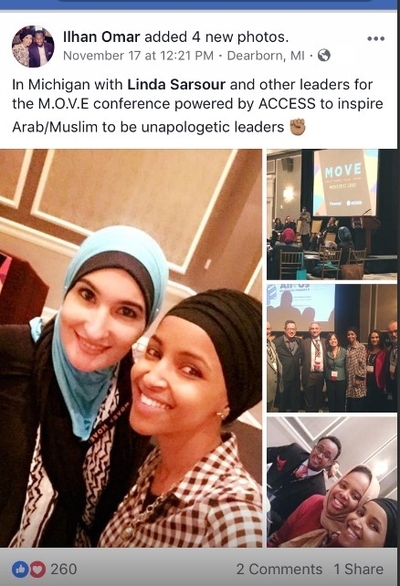 It's not clear whether Omar knew she would share the screen with Gadot, or whether that might have caused her to reconsider participating. As this new campaign begins, we might soon find out.